Networked collaborations of artists did not begin on the Internet. In this multidisciplinary look at the practice of art that takes place across a distance—geographical, temporal, or emotional—theorists and practitioners examine the ways that art, activism, and media fundamentally reconfigured each other in experimental networked projects of the 1970s and 1980s. By providing a context for this work—showing that it was shaped by varying mixes of social relations, cultural strategies, and political and aesthetic concerns—At a Distance effectively refutes the widely accepted idea that networked art is technologically determined. 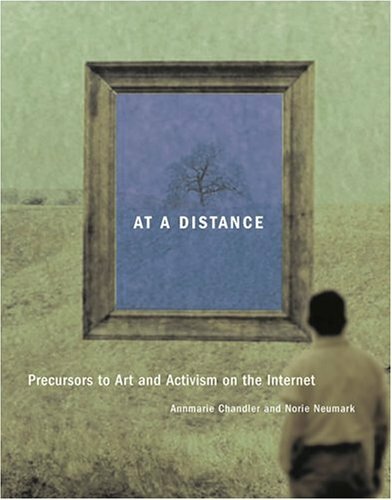 Doing so, it provides the historical grounding needed for a more complete understanding of today’s practices of Internet art and activism and suggests the possibilities inherent in networked practice. At a Distance traces the history and theory of such experimental art projects as Mail Art, sound and radio art, telematic art, assemblings, and Fluxus. Although the projects differed, a conceptual questioning of the “art object,” combined with a political undermining of dominant art institutional practices, animated most distance art. After a section that sets this work in historical and critical perspective, the book presents artists and others involved in this art “re-viewing” their work—including experiments in “mini-FM,” telerobotics, networked psychoanalysis, and interactive book construction. Finally, the book recasts the history of networks from the perspectives of politics, aesthetics, economics, and cross-cultural analysis.